So the first Deadpool movie was an odd surprise of a hit despite it going against what we can call conventional Hollywood wisdom when it comes to how superhero movies are supposed to "work". And with its success came the assurance that a sequel would be made to continue to capitalize on the success of that first venture. Deadpool 2 is the odd realization of that expectation and the seeming fantasy of these R-rated superhero movies continues on in a grand fashion. The first movie was already pretty crazy and it boggles the mind to consider how things might continue on and build on that first movie. The marketing behind this movie was pretty top notch ranging from materials that presented the movie in the style of other movies to very unusual product partnerships. The trailers were cut in a manner that hyped certain aspects of the movie and made it seem closer to a more traditional superhero movie but the final product was totally different. And I loved every bit of that. Synopsis: Deadpool 2 is the 2018 sequel to the first Deadpool movie as directed by David Leitch. The screenplay was written by Rhett Reese, Paul Wernick, and Ryan Reynolds. The movie begins on a sad note - with our "hero" Deadpool (Ryan Reynolds) trying to kill himself after circumstances led to his girlfriend Vanessa (Morena Baccarin) being killed by one of his kill targets that he failed to terminate the first time around. And even though he promptly gets to kill the guy responsible for her death shortly after, it doesn't change the fact that the love of his life is gone. Colossus (Stefan Kapičić) eventually recovers his remains and offers the X-Mansion as a place to rest and recover. Odd visions that we could term as the sort of things you see when you have near-death experiences convince Deadpool that he needs to do something better with his life. He joins the X-Men - well Colossus and Negasonic Teenage Warhead (Brianna Hildebrand) anyway - in response to a tense situation involving a young mutant named Russell (Julian Dennison), who calls himself Firefist. Deadpool decides to try and help the boy be better but finds himself needing to protect him from more than just bad decisions but a time-traveling mutant known only as Cable (Josh Brolin). What I Liked: This movie had a bit more of a coherent plot, even if it feels a little cheesy. But don't let that fool you - the writing remains very, very clever and they made sure to keep things surprising. Just when you think you know what's coming next, the movie nicely pivots to show that no, it's not going to be that sort of movie and they know you were expecting the thing that they've decided to avoid. The movie remains nicely self-aware and the jokes have evolved from poking at comic book stuff to even citing things from DC, Marvels classic rival publisher. And it goes beyond just throwaway lines snuck into the narrative here and there but even full scenes shot with this tongue-in-cheek humor driving things. And I love how the franchise continues to embrace this aspect of the Deadpool character. Having Cable in the movie was glorious and Josh Brolin really did justice to the character in his own way. 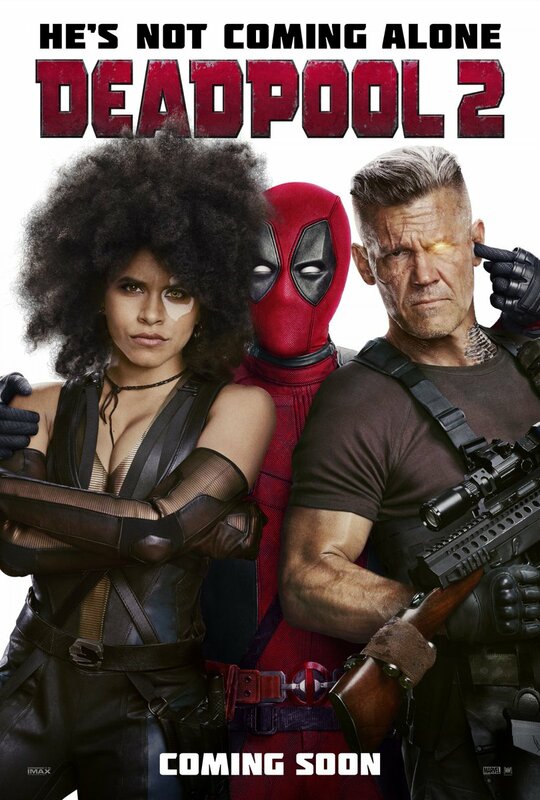 But beyond Cable I think we'll all agree that Domino (Zazie Beetz) is the runaway hit of a character who will really take things to another level when given the chance. Domino spin-off series anyone? Or let's at least make this incarnation of X-Force a regular thing. What Could Have Been Better: Vanessa's narrative was a sad one and it felt like a lazy bit of writing (ironically not cited by Deadpool as lazy writing in the movie). She was a great character who had a short arc in the first movie and this was aggravated in this one despite the "happy ending" that we got in the first movie. In the comic book world this is what we call "fridging the girlfriend" and I kind of expected more out of the writing team given all the recent attention on things like Me Too and other social movements. The movie also suffers from the lack of a solid antagonist as you know that Cable can't fulfill that role for the whole movie because that's just not how the character works. We had some other people thrown in for fun but it's not the same thing and this didn't really enhance the story significantly. TL;DR: Deadpool 2 is a fun movie and a great follow-up to the first one that builds on the original's success quite effectively. The side plot about Deadpool's personal journey may feel a little cheesy, but when you look at the comics it'll all make sense because he is that sort of a cheesy chracter. But given the fun that the movie offers, it still deserves a full 5 crazy Deadpool-esque asides to the audience out of a possible 5.